We Won More Bus Tickets! But We’re Not Done Yet. On Monday, September 19th, the King County Council voted unanimously to expand the Human Services Reduced Fare Ticket Program by around 20%. This will mean more tickets available for low-income youth, seniors, refugees, people with disabilities, and homeless people. Thank you everyone who has supported this effort! But we’re not done yet. 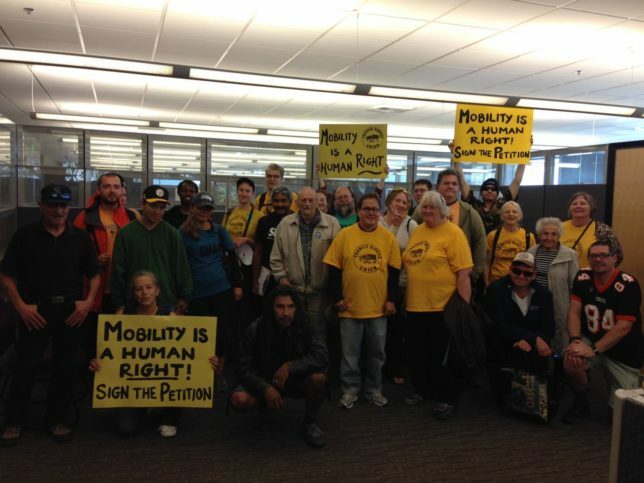 The very next day we delivered over four hundred letters and petitions, and a letter signed by fourteen organizations, asking King County Executive Dow Constantine and the King County Council to take further action to make sure that everyone in our community has access to public transit. We are asking the county to reduce the match price that service providers pay for tickets from 20% to 10% of face value, ensure that people who rely on the ticket program have access to all Sound Transit services, and to begin work on a very low cost transit pass for riders who can’t afford ORCA LIFT – like they’re doing in Calgary, Canada!